Imagine a giant canvas. Four young women walk towards it. They pick up brushes, pens and other mediums of art and start doodling. They don’t hesitate. It’s about freedom of expression. So, they pour out their thoughts taking from history, hobbies, memories and all that they have been encountering through their growing up years. What do you think will be the end product? A canvas of colour, lines, scribbles… basically a confused vocabulary, right? But Abheri Crafts is anything but befuddling. It is a beautifully constructed conglomeration of Indian colours, textiles, art, craft, history and so much more. A canvas that takes you down memory lane. 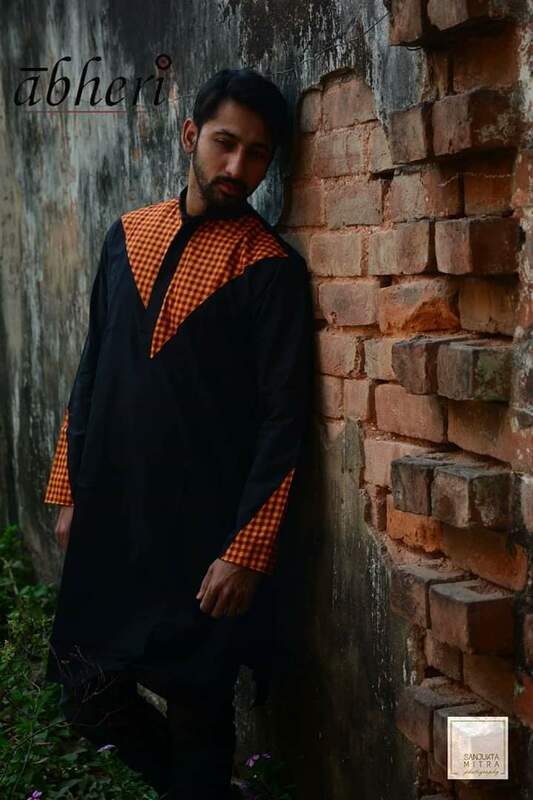 Through handmade sarees, dupattas, separates and menswear. Abheri is also an instance of how if you put your mind and dedication to it, you can make it happen. A labour of love that bore fruit on Valentine’s day of 2014, it was conceived by three school friends, Rohini Raychaudhuri, Sanjukta Ghosh and Punnya Guha Thakurta. They were joined in by Suchorita Ghosh, Sanjukta’s sister. Working in different sectors, what brought them together on the Abheri table was a common admiration for textiles, apparels and the recognition of the fact that the fashion industry could do with a sustainable fillip. The challenge was however, to create something that would be unique, yet plug into the cauldron of history and nostalgia that the four loved ruminating on. “While in college, we wore clothes that were designed by ourselves. Even when we bought separates off the rack, we would tweak them in a way so that they stood out in the crowd,” says Rohini, a professional vocalist, stage performer and painter at heart. If one were to tap into the mind of this artist, he would find someone who likes leaving her artistic signature on every item she lays her hands on. Her flair for design translated into hand-painted t-shirts and kurtis. Abheri was borne out of that need for a label that would be handloom and handicraft oriented, innovative, different yet not burn a hole in the pocket. It would tell the story of the four girls who decided that it would not only be about selling, but also about conceptualising looks that would leave a lasting impression. “The emphasis would be on intricate detailing, colour combinations and immaculate tailoring. 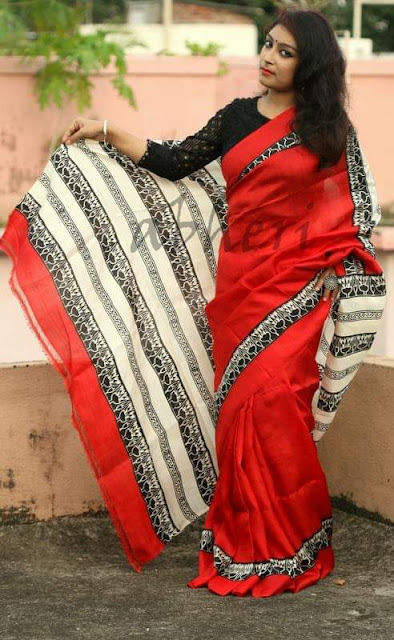 The price points were also kept in mind so that the Abheri would find resonance with the younger masses, the lot who believe in wearing well-tailored, handcrafted sarees and outfits that spares a thought for the environment, the heritage crafts and weaves of India. If the prices are too high, it alienates everyone at the very outset. 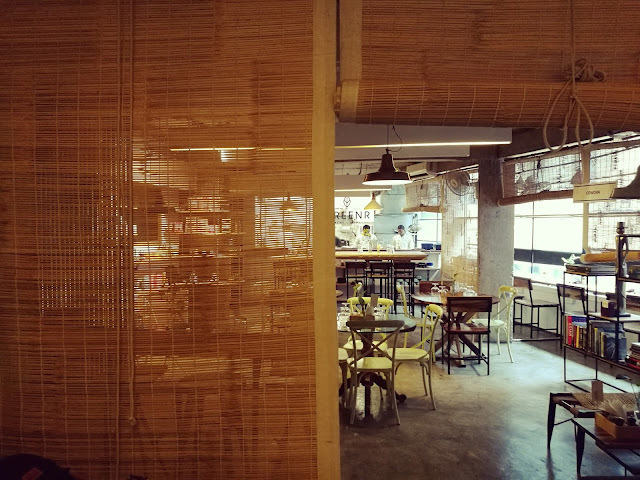 But that doesn’t mean we compromise on make and quality,” says Suchorita, an interior designer by profession as well as an avid crochet weaver and embroidery enthusiast. History is the major fodder for inspiration. Graduates in history, Rohini and Sanjukta have often delved into the country’s mine of architectural and archaeological heritage for references of motifs and designs. 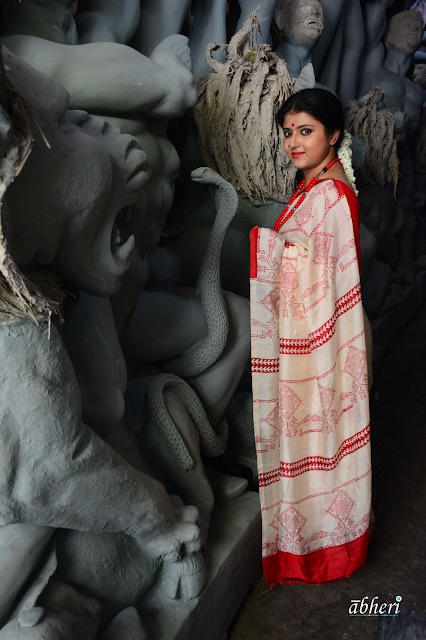 The research with seals of the Harappan civilization were translated into patterns on a tussar saree. The pottery designs from the NBPW Culture found a second coming on kurtas and sarees. “We really wanted to stretch the parameters of the old craft of blockprinting by designing our own blocks. The motifs were taken from lores and history but we wanted the execution to be contemporary. 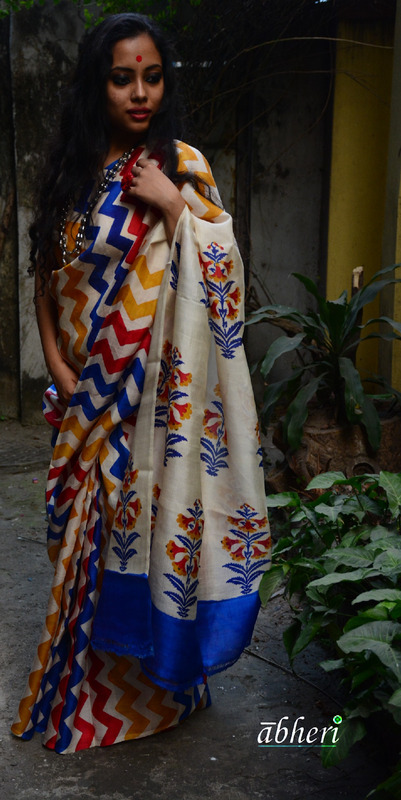 Their intrinsic Bengaliness saw an outpouring in their Alpona series where handblockprints and embroidery were inspired by the art of alpona they saw in Santiniketan, where the soul is steeped in the teachings of Rabindranath Tagore. “Some motifs were borrowed from Santhal and Munda wall paintings,” narrates Punnya, a teacher and a keen photographer. Entrepreneurship can never be easy. The Abheri girls, after spending years in academics, recognised this truth the moment they plunged headlong into the trade. Without any knowledge about sales or marketing, they had to learn the ropes in the way. But the most crucial problem was making an in-road into the minds of the weavers, craftsmen and printers, convincing them and earning their trust. A legible dialogue had to be established so that the designs would be executed as per the original ideas. Roads unknown were travelled to the interiors of villages to get their hands on authentic handwoven fabric and also to learn the crafts. It has been four years of incessant learning and experience. All for the sake of creating a thing of beauty that has history, heritage and aesthetics woven into its labyrinthine folds. 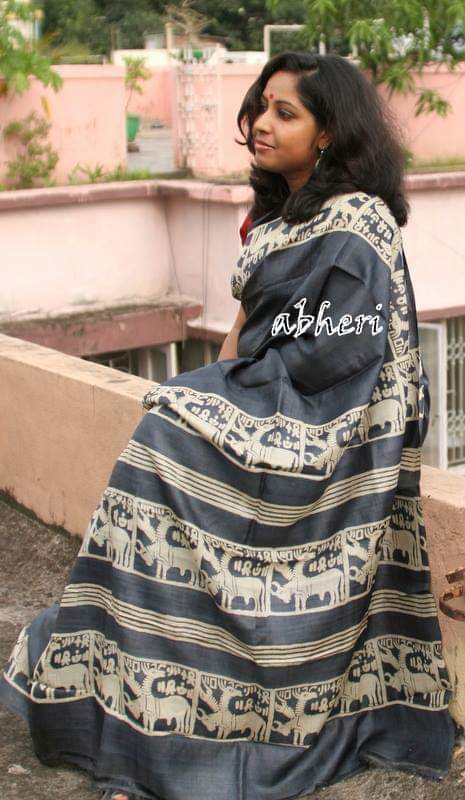 Do visit Abheri Crafts on Facebook and @abhericrafts on Instagram to view their exquisite creations. Call +91 8961649434 to get in touch with them.